All candidates for president are network or local. 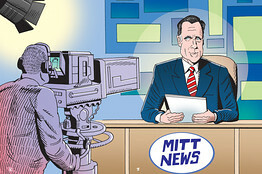 Romney is a network anchorman—sleek, put together, the right hair, a look of dignity. He’s like Brian Williams. Some candidates are local anchormen—they’re working hard, they’re pros, but they lack the patina, the national sense. Reagan, Clinton, Obama—they were network. This has to do not only with persona, but with a perceived broadness of issues and competencies. It’s not decisive, and it can change—Harry Truman was local, and became network. But it probably helps Mr. Romney that he’s network. And it probably helps Mr. Williams’s comedy career that Noonan made that comparison. This entry was posted in Uncategorized and tagged Brian Williams, Mitt Romney, NoodnikWorld, Peggy Noodnik, Peggy Noonan, Wall Street Journal. Bookmark the permalink.